To use this map, simply unzip to your Maps Folder in your Stronghold Directery. ( C:\Program Files\FireFly Studios\Stronghold\Maps ) It will then be avaliable under the Economics Section of the game. A friar, that attends to a healing spring located in an old, abandand, mountainous ruin, has reported that a recent earthquake has uncovered the entrance to what he thinks to be The Lost Dwarven Mine of Theos. Legend has it that this mine is cursed, possibly responsible for the small outpost to become a ruin in the first place when they inadverntantly stumbled onto the mine and met their fate. A healer working with the padre swears that he hears Wargs prowling about at night since their discovery. Dispite all the rumors however, a consortium of merchants and engineers, along with religious officials, have financed an expedition to reopen the mine and rebuild the town. Get the mine opperational, and show a nice profit to reimburse the consortium for their investments that they have already given to the project. But at the same time, beware of The Curse of the Lost Dwarven Mine of Theos! 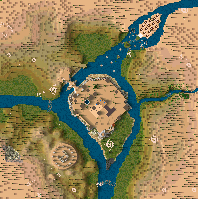 1) A large plateau in the center of the map accessable only by a single bridge suitable to build the town on and defend it from both man and beast. 2) Ample crop growing space. 3) An abundance of game animals. 5) A megalithic calendar complette with pointing stone and sacrificial altar. 6) The Fabled Lost Dwarven Mine of Thoes. One of the richest sources of iron ever known. Have Fun and Enjoy this map. The person who created this map has an evil and devious mind. It starts out great. Wonderful things happen to increase your popularity. You find the mine, but it's populated with tons of wild animals. I ended up feeding those wild animals with literally dozens of troops before I managed to clear them all out. And then the curse hit!!! Play the map yourself to find out what I mean, but I will tell you that my popularity hit ZERO and I only had 4 workers for the longest time. You know how some maps you can walk away, take a potty break or whatever, and things are okay when you get back? Well, this one was NOT like that. You don't dare walk away or you will come back to find everything in ruins. This map kept me entertained (frustrated) for days before I managed to gain victory. In other words, my favorite kind of map. Playability - 4 - This map came very close to being a 5 for playability but for a few problems towards the end of the mission. Clearing out the mines and hitting the curse was great fun, I was kept glued to the screen for most of the mission. I did though find the 450 iron requirement at Hard towards the end started to get a little boring, at that stage I really had the rest of the mission under control and spent some time just waiting for that goal. I also hit another problem that I presume the designer didn't forsee near the end. The tunnel at the signpost got blocked, presumably with trees, and the bandits could not get out into the rest of the map, nor could I get to them. It also seemed that they couldn't get off the map, so I never could meet the final "Eliminate enemy" objective. Balance - 5 - I felt this map was just the right mix of not too hard but certainly not too easy. I had to replay parts of it and it really took some work to win. Creativity - 5 - This map was very creative, it has some wonderful eye candy, some novel ideas, interesting objectives and a creative storyline. Map Design - 5 - A wonderfully designed map with a large range of interesting features. Really a pleasure to look at. Story/Instructions - 4 - A very good story, creative and works really well with the map. Unfortunately a number of spelling errors spoilt the effect slightly for me. I know this has two reviews already, but the more the merrier! Balance: A good 4, pushing 5, with the goals and events well thought out generally. Bit of a tough map, it certainly challenged me! I managed to hold off the wolves to a degree, and by God there are wolves here! Creativity: This is a very good map. The curse is cleverly thought out and the whole game pulls together nicely. Whilst I don't want to reveal to potential downloaders the idea behind the map, if you haven't already figured it out, that it, think carefully how you want to approach it. I love maps where you have to work out what is required to win, and there is sufficient here to keep most people pondering. Map Design: Again, very well planned, with what I thought were subtle eye candy tricks (always preferred in my opinion). The map itself was good, but I had to give it 4 rather than 5 based on the work I have seen on numerous other maps on the site. This is not a criticism, the map was well made. A little more thought into the playability would raise this to a 5. Story/Instructions: Not a bad write up, the instructions are good and compliment the map. Another map I will keep on my hard drive for a while to come yet! Well done, and thank you for keeping me up late last night when I should have been studying!! I really enjoyed the map design on this one, The bridge, the mine, everything worked great for me. The balance and playability was off only in the sense that the iron goal seemed a bit high. Otherwise, it was great. Loved this one!! Drove me absolutely nuts and it has taken me 8 tries to get through this one and that was only on easy!! Let's see how long it takes me to get through it on higher levels. I too hit that little problem with the invaders getting stuck at their entry point but there is a way around it. It took me a while to figure it out but there is a way. I'm not going to write it here - why spoil your fun!! But if you really can't get past that bit, email me and I'll let you know! I hope we get more like this one - very creative!! Playability - you owe my husband a meal, since the one I was trying to cook while playing burned! I couldn't peel myself away! Creativity - Nice idea. I can tell a lot of thought went into that one. Map Design - Very nice use of unusual terrain. Lots of eye candy that blended very well together. Story/Instructions - Well thought out and tells just enough to keep you from being completely caught off gaurd, but not enough to give away the secrets! Very nice game. More please! I had a really great time playing this map. Made a mistake the first time around by deleting the gatehouse near the wolves... created something of a problem to say the least. I liked the map design a lot and found the goals to be challenging. I totally want to try this map at a more difficult level now. GREAT!!! Very challenging. still havent beat lol. Why must the map be locked, the origional is always gonna be here right. But fun none the less. The mine was a little too far away, but on easy if the one inside the castle gets started right away then its not so bad. The mood is set wonderfully. The curse is quite dangerous. Alot of heart and soul went into creating this map. Being one aflicted with a slight case of dislexia, the story is followable. Additional Comments: I got away with just having one gate house and the castle became enclosed. I dont know if this is intentional or not.